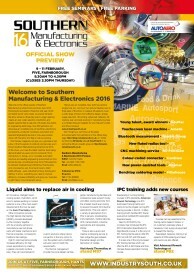 The Official Preview for Southern Manufacturing & Electronics 2016 has been published. All pre-registered visitors will be receiving a copy of the print edition by post. But If you’ve yet to register for Southern Manufacturing 2016, don’t worry as you can view the full edition online by clicking the picture. The Preview features 16 pages of new products, innovations and engineering expertise from nearly 100 exhibiting companies. Just some of the topics covered include machinery and tooling, electronic components and assembly, subcontract services, consumables and much more. But even this is just a small fraction of what will be on show at FIVE, Farnborough from February 9th to 11th.